It is a common sight on fresh air supply systems to see cardboard framed panel filters that have collapsed due to high moisture content from weather conditions including rain and humidity. When moisture gets into the cardboard frame its rigidity can fail causing the filter to deform and sag in the filter frame. In worst case scenarios the panel filter can fall out of its frame entirely with catastrophic consequences. The amount of moisture in the duct is often dictated by how close to the fresh air inlet, a panel filter is located and there are a few options available to a designer / contractor / FM engineer to solve the problem, with a simple change in the air filter being used. 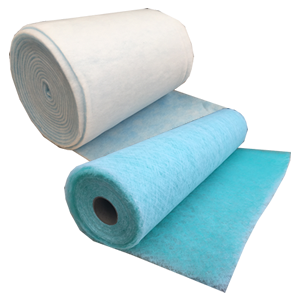 Air filter manufacturers often offer a range of air filters manufactured from “Beverage Board”, (a cardboard often used in the catering industry) as it is a moisture resistant material. This obviously can offer advantages in a supply air duct, but can still perish over extended periods of high humidity. Pleated and glass panel air filters manufactured from beverage board typically are available for around double the cost of standard cardboard framed panel filters. 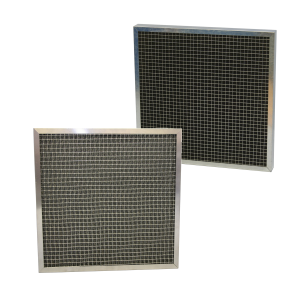 Airclean offer a Metal Framed Pleated Panel Filter as a robust and trustworthy solution to high humidity air filtration. Standard G4 Pleated material is sealed into a galvanised steel frame ensuring that the air filter will remain rigid in all circumstances. In addition a wire mesh is fitted on one side of the panelto ensure the pleated air filter media maintains its shape and integrity offering its maximum efficiency. The Metal Framed Pleated Panel Filter is a retrofit solution available in all standard and non standard sizes to suit the needs of the application.